A lot of products for spotty skin are aimed at teenagers and are full of horrible things like sulfates and microbeads — ultimately, they do your complexion (and, in the case of microbeads, the environment) more harm than good. The products in the today’s post are different. They’re targeted towards oily/combination skin but don’t aim to aggressively strip it of all moisture (thereby making the problem worse). So I put them to the test, to see if they made a difference to my spotty, stressed-out face. Inside the box there’s a T-Zone Control Cleansing Gel (50ml), an Invisible Pores Detox Mask (15ml), and a T-Zone Balancing Gel Cream (15ml) — everything you might need for a basic skincare routine. I love using the gel cleanser in the mornings because it has a really nice slip and doesn’t make my skin feel like it’s been dried out. It’s also antibacterial, which is great for fighting the bacteria that can cause breakouts. As lovely and light as it is, the moisturiser leaves my skin wanting something a little more hydrating and doesn’t quite balance it as much as I’d like. Oilier complexions (I have combination skin) may really get along with it, however, since it definitely tackles oil production. The face mask is a clay one and it’s so good at calming down breakouts. I use it in the evening, leaving it on for ten minutes or so before washing it off and applying moisturiser as usual. The next morning my spots have always shrunk drastically and although you can’t change the size of your pores, this mask does tend to make them look smaller. If I was going to buy one full-size Clarimatte product, it’d definitely be this one. 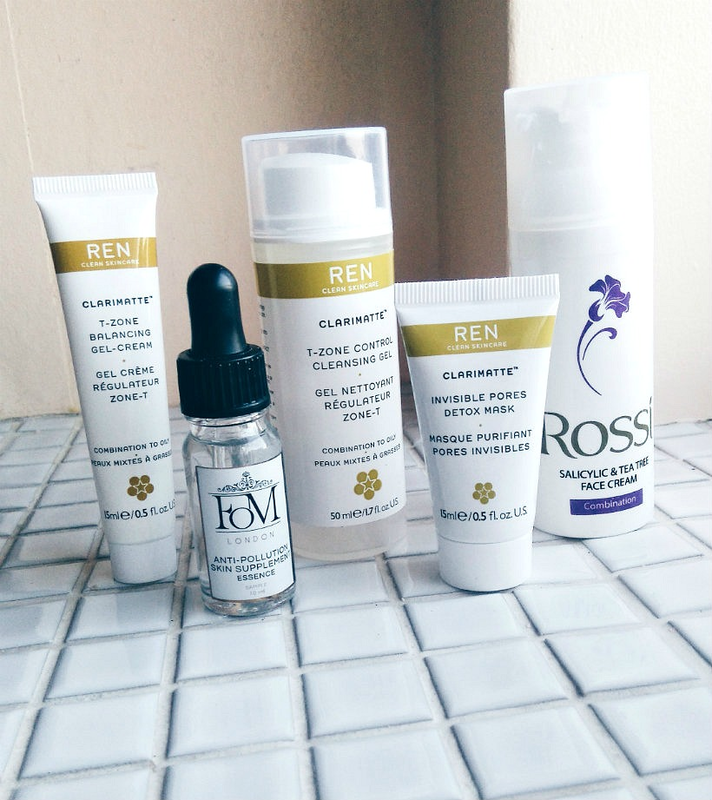 All in all, REN have made a really handy kit if you want to try the Clarimatte range without splashing out on pricier full-size products. I had high hopes for FOM’s anti-pollution essence but it just wasn’t meant to be. A watery liquid, you add some to a cotton pad and sweep it across your face before using serum and moisturiser, the same way you’d use a toner. It’s infused with hyaluronic acid to hydrate, juniper and sage to protect your skin from pollution, red raspberry leaves to regenerate, and guava to reduce redness and dark spots. Phew. I first used the essence when I went to London to spend the day with my friend Giulia, and hoped it would make a difference. When I was working in London it aggravated my acne something terrible and I still ended up with a flare-up this time, having been away from the city for a month or so. This put me off using the essence but I wanted to give it a fair shot. However, the next time I used it my face itched so much I ended up cleansing again to get rid of it. Now I’m not sure if the problem was London or the product itself (probably a mixture of the two). I’m kinda gutted because I really like the idea behind the product — London pollution causes problems for skin so why not combat them? — but my skin did not. FOM won an award for the essence so perhaps long-term use makes a difference on someone with less sensitive skin? I love this moisturiser. It can be quite tricky to hit the nail on the head when you have combination skin but Rossi’s salicylic and tea tree moisturiser is designed especially for that very problem, and is the perfect balance between calming and nourishing. Salicylic acid and tea tree are two of the best ingredients for tackling spots, so it’s no wonder this cream works as well as it does (for me, at least — everyone’s skin is different). It’s hydrating, it doesn’t cause an oil slick, and it doesn’t irritate my existing acne; it just gently treats it. A dream. What are your favourite blemish-zapping products? Have you tried any of these? Let me know in the comments!